Aston Villa’s fifth game of the Championship season saw yet another away game and a trip to Quorn FC, where last time we left with the 0-1 win and a Kerri Welsh goal. It was a lovely day for football as the sun was shining overhead and yet it wasn’t too cold or not too warm. After our last game getting our first point the season and first clean sheet, it was a real feeling we could leave with something from this game. 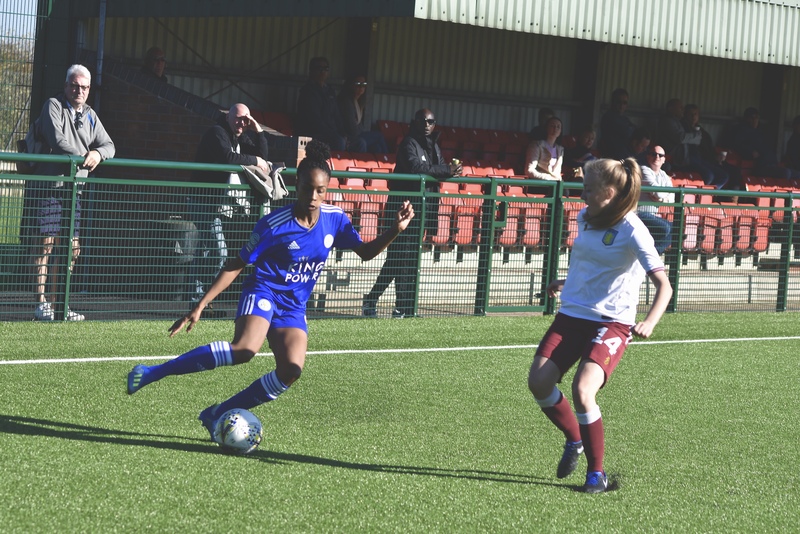 Aston Villa came out of the blocks fast as they took the game to Leicester City with less than five minutes on the clock Kerri Welsh hit the shot that cannoned into the Leicester defender after some great work by Phoebe Warner to play in Kerri Welsh as the score remained 0-0 as we made a great start. The Villa pressure continued as Jodie Hutton went like a steam train down the wing with no one being able to stop her (this was the story of the first half unless they fouled Jodie) and unleashed a shot but the ball just went the wrong side of the bar as it stayed a stalemate but for how long as Villa were on the front foot. Leicester had little of the ball in the opening twenty minutes as once again the next big chance of the game came for Villa as Jodie Hutton once again drove at the Leicester defence and whipped the ball into the box as Alison Hall leapt and connected with the ball off her head but once again so close but no cigar as the ball just went over the bar. On the 19th minute Villa’s pressure and Jodie’s pressure paid off as Jodie Hutton smashed the ball home to give Villa the 0-1 lead, totally deserved and a beautiful moment for Jodie as she celebrated the goal, No one deserves it more than Jodie (also it brought out my favourite Villa Ladies gif so far on twitter). 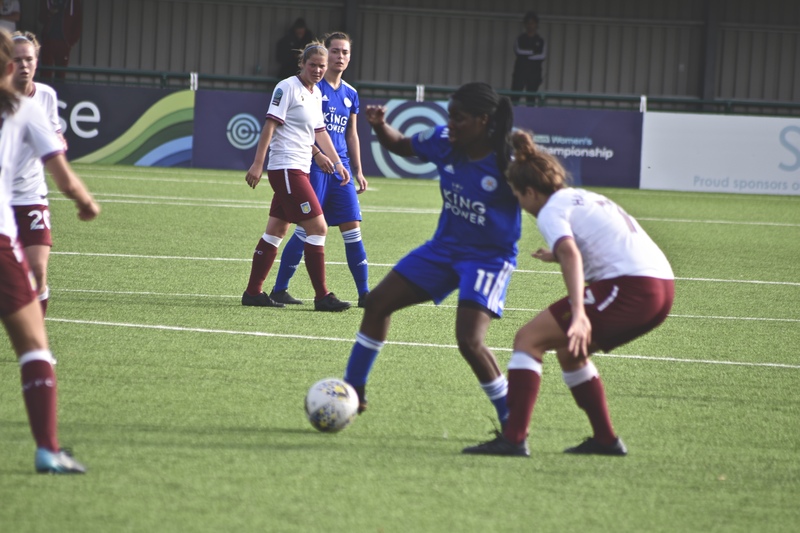 Less than five minutes later once again it was Villa on the attack as Leicester didn’t know what to do as Kerri Welsh connected with a diving header and just as it looked like the ball would rustle the net, Demi Lambourne managed to get down to block the ball and keep it at 0-1. So many chances that kept coming but the ball wouldn’t just get into the back of the net and on the 42nd minute Leicester hit a hopeful ball into the box and as Sian Rogers had the ball in her hands the Leicester player crashed into her as the ball came free and a pinball esque scramble in the box lead to a Penalty for Leicester, typical that the chances we had and no pressure but yet a shocking call gave Leicester the chance to draw level before half-time as they did when Rosie Axten gave Sian Rogers no chance even though Sian guessed the right way making it 1-1. During the first half, a beautiful set piece by Amy West saw a goal nearly come through as well. A first half dominated by Villa but didn’t make the chances count meant we went into the half time break even but Leicester looked like couldn’t handle our play and didn’t have an answer with a big second half coming up. As the second half kicked off within a couple of minutes once again it was a Villa chance as Kerri Welsh directed her header that crashed off the inside of the post as the ball broke free once again Kerri so unlucky not to score as it hit the woodwork, but a great start once again for Villa. I don’t wish to say much on the referee through this game or report because anyone who was at the game will know exactly what his performance was like. Just before the hour Ashlee Brown replace Hollie Gibson and Asmita Ale switched wings as Ashlee Brown went to the other side. The game started to turn into a midfield battle as each team had possession and moves that didn’t turn into much. Jodie Hutton timed her run perfectly as she ran around the Leicester defence but to be given shockingly offside. On the 71st minute, Sophie Haywood replaced Phoebe Warner. 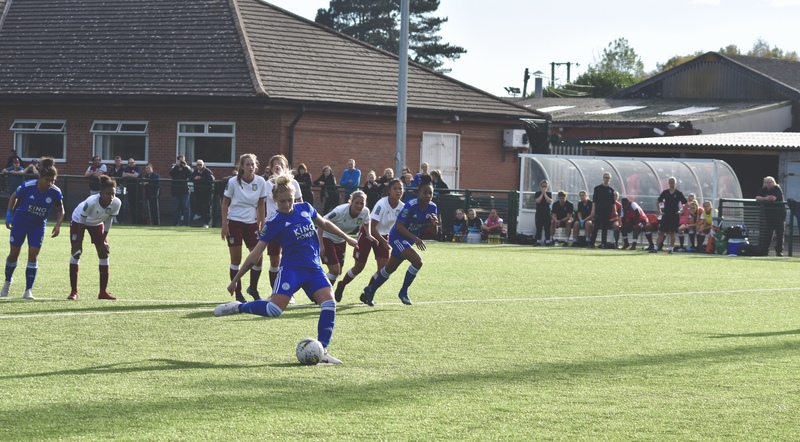 Leicester started to create some pressure and hit some snapshots but nothing that truly challenged Sian Rogers in the Villa goal. Once again some beautiful play built towards a free kick that Kerri Welsh nearly converted as it just went wide (Kerri could have had a hat trick but just wasn’t meant to be but on another day these will hit the back of the net). On the 78th minute, Tanisha Smith replaced Kerri Welsh who had ran herself into the ground and gave everything during the match and deserved her ovation coming off the pitch. Late on in the game Leicester had a few chances but one really stood out as Freda Ayisi broke into the box and just as it looked like she was going to trouble Sian Rogers in the goal, she struck the ball and I’m not quite sure where it ended up but it was a let off for us as we defiantly didn’t deserve to be on the losing team through this game as the match ended 1-1. We now have a second game where we have picked up a point and moved off the bottom of the table. Something that not only is happening in the table but also on the pitch as you can see the team bonding and forming partnerships as the season goes on. Today was a joy to watch some of the play and we were so unlucky to only of scored the one goal as everyone worked their socks off on the pitch. We were punished by a controversial penalty as Sian Rogers was fouled was before the penalty was given. It’s a little bittersweet as we were much the better team during the game and had more chances but walked away with the point. But again something to build on as we move on to the next game when once again we travel away to play Tottenham Hotspur on Sunday 28th October. I only want to mention one more thing as finish this match report but I truly feel as a fan over the last few years that Aston Villa Ladies right now are in a great place as they build and grow, Our manager and her team, Our players, every single one of them to the parents and the other fans I’m lucky enough to enjoy the games with but it feels a truly great place to be and I’m very proud and happy to say this is my team and my club. Unused Subs: Aguirre, Gane, Elsmore, Baptiste.